Brandy is the most traditional, but we love a mixture of dark rum and Cognac. Some folks will add to that duo a third spirit: bourbon. We find that the trio is a bit too boozy – the ‘nog gets lost. But if you like that sort of thing, go for it. Because you’re using the spirit as a mixer, there’s no need to break out the most expensive bottles on your bar (unless of course you want to – it is the holidays after all). Dark rums we like include The Real McCoy 5 Year, Privateer Amber, and Ed Hamilton 86 Proof. Great Cognacs that would work well, and won’t break the bank are: Pierre Ferrand Ambre, Germain-Robin Craft Method and the Marie Duffau Napoleon (an Armagnac). We recommend a ratio of 1 part spirit to 5 parts prepared eggnog. Which means if you buy a one-quart container of ‘nog, use 6.5oz of spirit, total. We top each glass with a grating of orange peel, which adds a vibrancy to all of that creamy richness, as well as a short dash of freshly grated or powdered nutmeg. Enjoy your eggnog – and Happy Holidays! This entry was posted in Cocktails, Learn About Spirits, Party Ideas and tagged cognac, eggnog, rum, spiked eggnog on December 14, 2016 by bottlesfinewine. Christmas parties call for one classic drink: Eggnog. 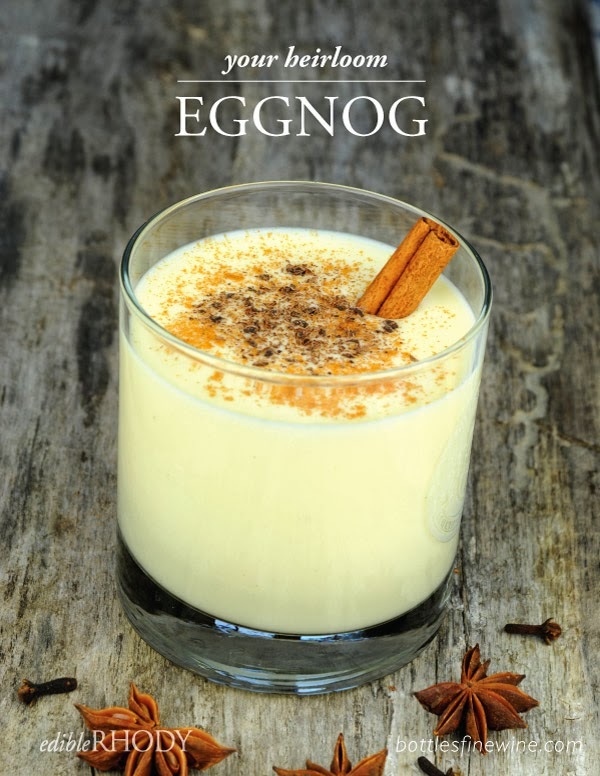 There are plenty of good pre-mixed eggnog options, but don’t you think there’s something special about food and drinks lovingly made from scratch? Edible Rhody Magazine has provided us with an easy but delicious homemade Eggnog recipe that will please all you guests. You’ll just need a few basic ingredients, brandy, rum, and a blender. We recommend that you adjust this basic recipe to your taste buds. Don’t like nutmeg? Try using cinnamon, clove, allspice, or a combination of these spices. Need variety in your life, and want to explore other liquors other than brandy or dark rum? Applejack, bourbon, or madeira are interesting flavor twists. Experiment, enjoy, and create a tradition! Beat eggs in blender for 1 full minute on medium. Sprinkle in sugar while blending for another minute, then add remaining ingredients while blending thoroughly. Chill completely in the refrigerator and serve with additional nutmeg grated on top. Serves 2 generously, or 4 in moderation. This entry was posted in Cocktails and tagged christmas cocktails, cocktails, edible rhody, eggnog, holiday, winter on December 14, 2013 by bottlesfinewine. We are Bottles, a fine wine, craft beer and liquor shop in Providence, Rhode Island founded on the basic principles of seasonality and accessibility. Subscribe and enjoy food and wine pairings, great drinks, and entertaining tips -- Cheers! Bottles_PVD @ClarkeCruWines Hey thanks, @clarkecruewines ! Bottles_PVD @RaySullivan There are enough Irishmen here at Bottles, you'd thought we would have caught that. Thanks Ray!! Bottles_PVD Make that 5pm! 5pm to 7pm tonight, Thursday 2/22/18. Sorry about that! Bottles_PVD @ErikLoomis Oh, we're with you on that Erik. Thanks so much! Bottles_PVD @ErikLoomis They are actually among our more affordable bottles. Both are under $18!